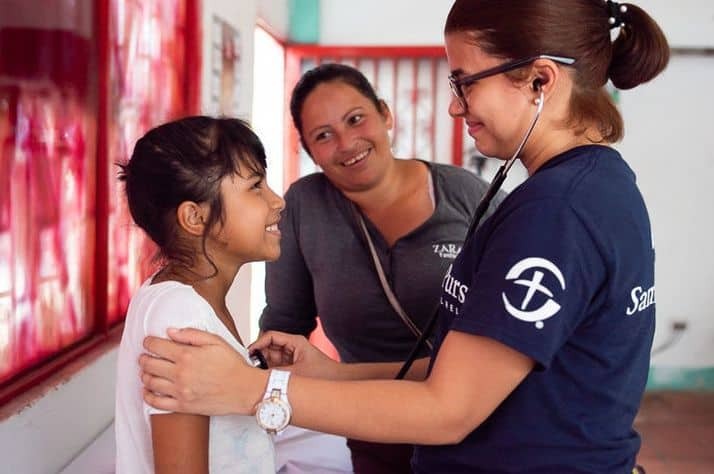 Maryelis came to the Samaritan’s Purse mobile medical brigade (clinic) in Puerto Santander, Colombia, suffering from some minor childhood ailments. The doctor saw her and provided her mother Jennifer with the appropriate remedies, including a fever reducer. It was a simple interaction, but for Jennifer and Maryelis [featured in the video above], there is nothing simple about their lives anymore. They make a dangerous crossing over into Colombia a couple times a week to sell fish and buy staples because their home country of Venezuela is in economic freefall. Hyperinflation has robbed the currency of its value, and food and medicine are in short supply. Simple pain relievers—when available—can cost up to a month’s salary. In some cases, hospitals are no longer able to provide even basic care. Jennifer described long lines and angry people waiting for what little food is available in Venezuela. It’s difficult for the single mom to provide. “You have to fight. You don’t live there, you [just] survive there,” she said. Maryelis and Jennifer are among the thousands of Venezuelans we’ve helped at our two mobile medical locations in Colombia. The work continues as the flow of migrants increases. Most have no other treatment options available to them, so they are greatly appreciative of the compassionate and quality care we provide at no cost. “It means the world to these mothers who have a sick child and feel hopeless,” said Melanie Wubs, Samaritan’s Purse medical coordinator. Please pray for our continued ministry in Colombia among Venezuelans who have fled their country or who are regularly crossing back-and-forth between the two nations.